​It's always fun to get inspiration from different places for DIY projects and gifts for friends and family. 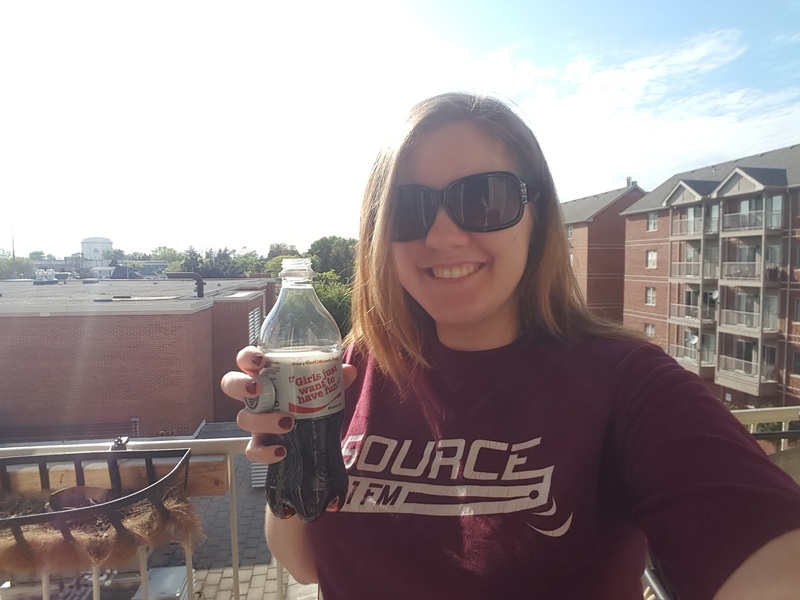 Since I love music it wasn't very hard to get inspired to #ExpressUrSelfie by the “Share A Coke And A Song" lyrics that are featured on Diet Coke® (plus there is an amazing Share a Coke sweepstakes right now!) 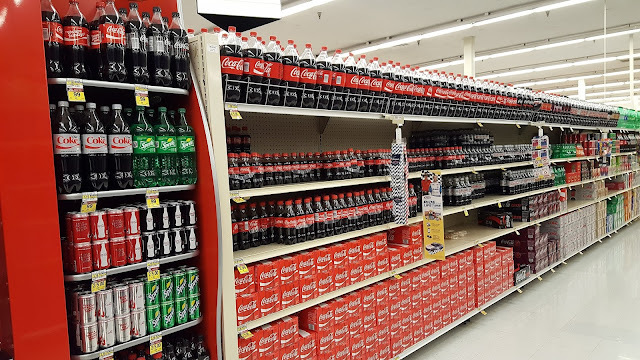 and other Coca-Cola™ products. It wasn't hard to figure out who I'd be sharing a song with either. With my college best friend's birthday in the not to distant future I knew I needed something that showed our love of music and our song. Yes my best friend and I have a song. Don't you have one with your best friend? At some point during our college career "More Than a Feeling" became our song and we love to sing it with each other out of tune of course) and it makes me think of my best friend every time I hear it. Kevin and I made sure to stop and take some time during our latest grocery trip to Jewel and pick out some very inspiring bottles! I think I spent like 10 minutes picking out the bottles with the best lyrics. Jewel had a ton of stock to choose from, we even were checking out the coolers at the end Gotta make sure I have great inspiration right? 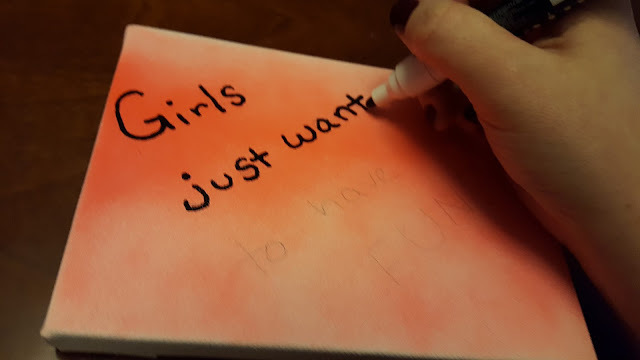 I was super excited to find a bottle that had "Girls Just Wanna Have Fun" on it. While "More than a feeling" is our #1 song, 80's classics like "Girls Just Wanna Have Fun" are a close second for 80's junkies like us. I thought with those two phrases would be perfect to make two little mini lyric canvases. 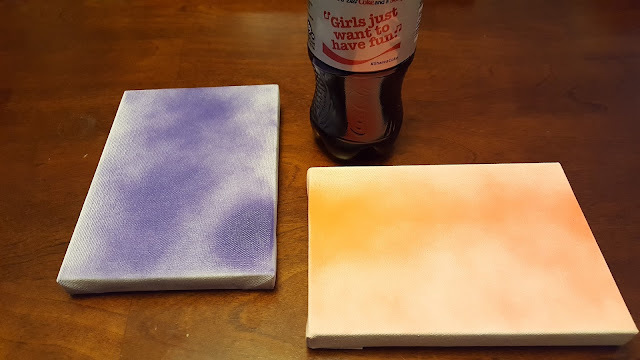 After a not so subtle attempt at figuring out what colors Becky would like for something on her wall I was off to the craft store to get some spray paint & canvases! 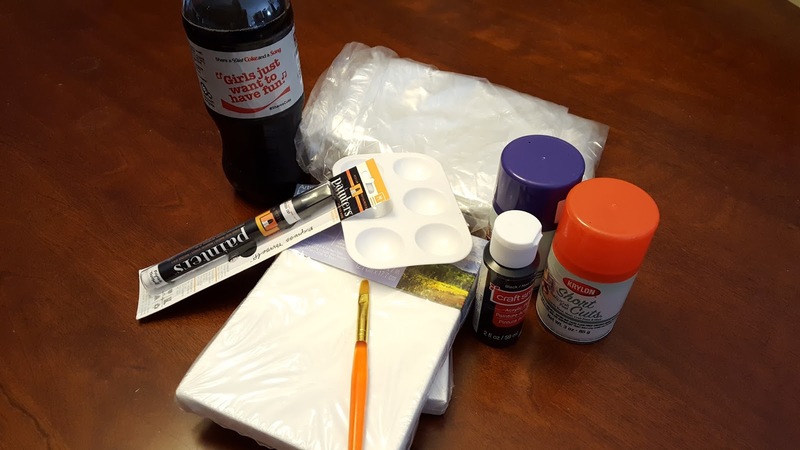 The tools needed for this project are pretty easy this time around. First off head outside to use the spray paint. Be sure to use your drop cloth!! I did a test spray since I haven't used spray paint in forever, I would highly suggest it. Spray! I wanted to make sure there were different looks to the paint on each of the canvases so I did not spray too heavily. 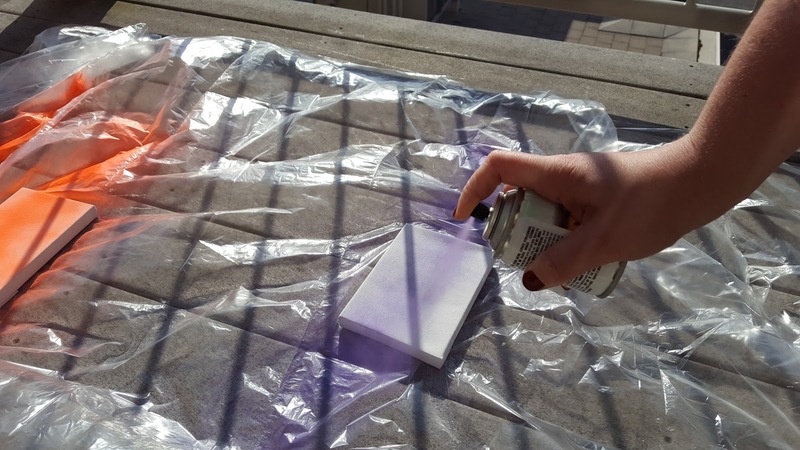 Kevin got a great action shot of me spraying the purple canvas. Again try to make them different and unique. 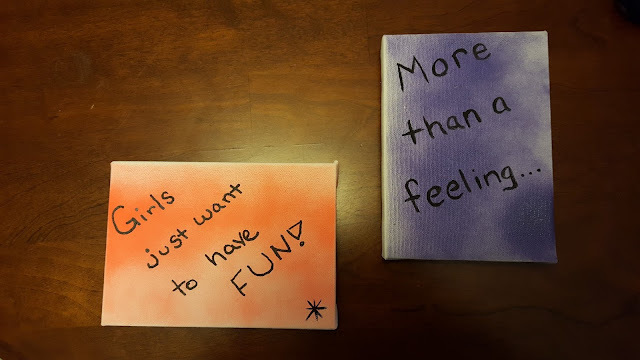 You and your best friend are unique, the lyrics are unique so why should each piece of canvas art look the same? Break time! 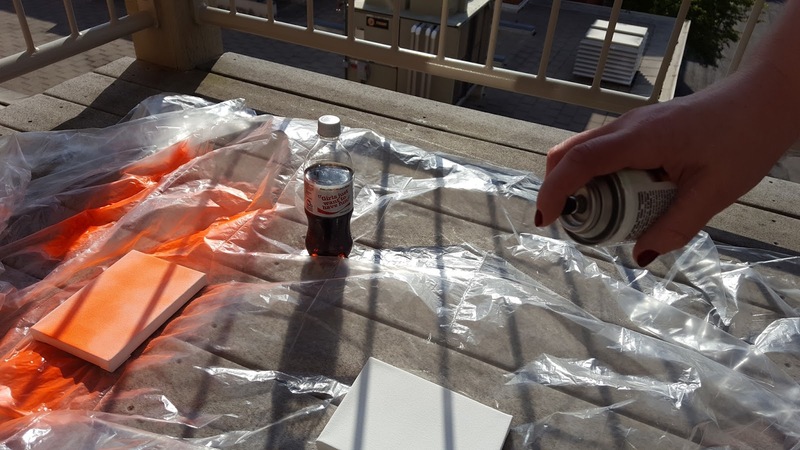 Besides needing to be outdoors for the spray paint it was a beautiful day to enjoy the balcony with a cold Diet Coke while the spray paint dried. I had some time to test the new Shazam app too, which helps you identify songs and get lyrics, I have an android but it is available on Apple products as well. I definitely put the app through the ringer, I did trick it one time with a remix of a 90's song but it was a remix. 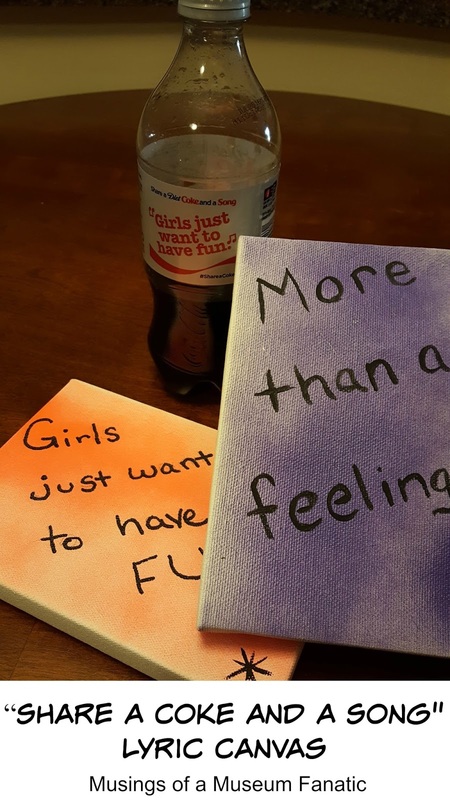 If you snap a shot of the Share a Song lyrics on your Diet Coke bottle it takes you to a video where you can make your own mini music video. 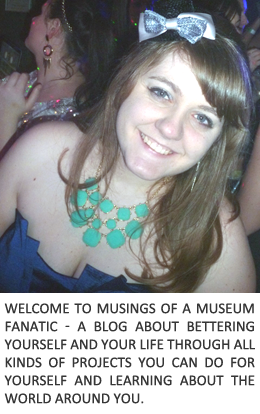 Let's just say I had way too much fun with that part! For the next part you can bring it back in to the kitchen table. 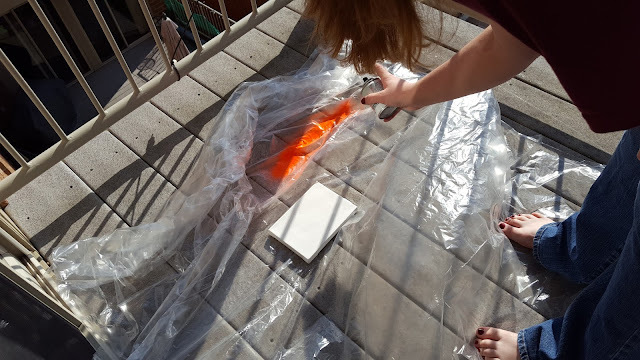 I'm not very good freehand so I gave myself a little guide for the orange canvas, where I went with the paint pen. For the purple canvas I freehanded with the small paint brush. Not gonna lie next time I'll figure out a stencil and go that route haha. My handwriting leaves something to be desired but I know Becky will love it because she knows my handwriting and what the lyrics represent. I had such a ball making these super easy. If you're a big fan of gallery walls doing something like this will add distinct pops of color among your photos. My plan is to do a few more for my best friend and make a little lyrics gallery. 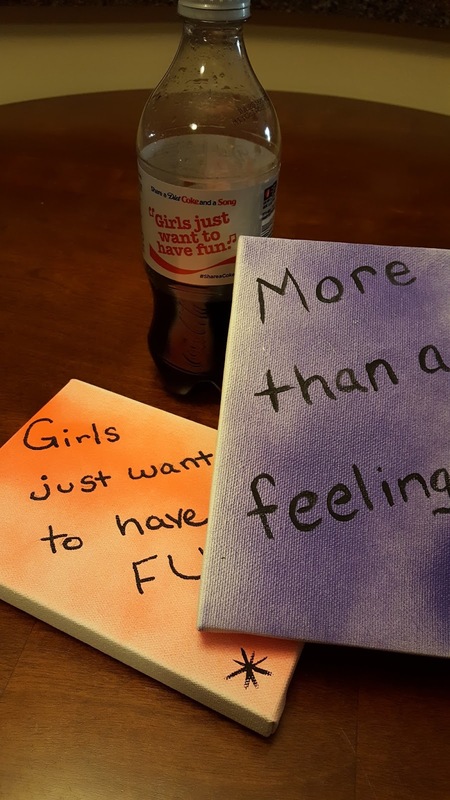 Who would you make a “Share A Coke And A Song" lyric canvas for?